Across the globe, events are being created for women entrepreneurs to tell their stories and share advice with individuals who are building companies or dreaming of ones to create. 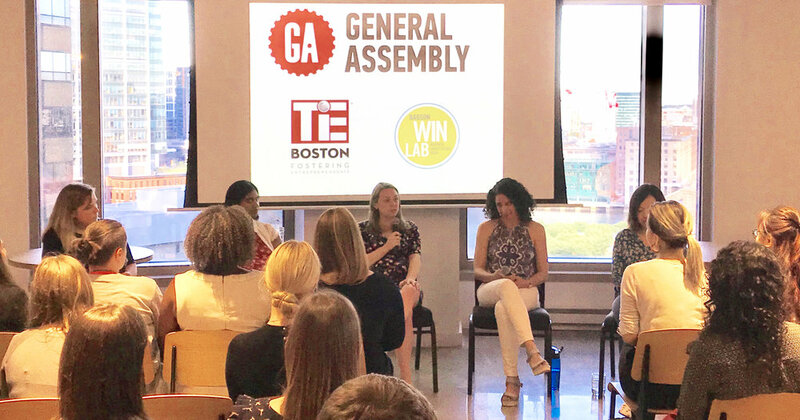 In partnership with General Assembly and TiE Boston, the WIN Lab invited four female founders to engage in a conversation about the ups and downs of entrepreneurship. Joined by Shiva Kashalkar, of Green Pinata Toys, Emily Bernard of PlacePass, Linh Tran of XOI Beverage, and Sue Levy of Savory Living, here are four pieces of advice for early stage entrepreneurs. You Don't Have to Know It All to Get Started. From the very beginning, Sue Levy of Savory Living knew that she wanted to help people eat better but she wasn't quite sure how to start doing it. When you have one goal but numerous pathways to achieve it, choosing one and moving forward can be hard work. So, with the help of her mom, Levy gathered her first pilot group and tested an online platform system that these individuals could use to achieve their health goals. Utilizing free and simple tools like Google Sheets, she was able to test and track in order to understand the needs of her future clients and start pivoting and implementing from there. Her advice? You don't have to have everything figured out to get going. Just use what you have at hand and start moving forward. Many entrepreneurs will tell you that if they knew how hard building a business was when they began, they might not have started the journey. Maintaining a positive attitude and the motivation to keep going even on the toughest days can be an integral part of being successful at growing your startup. Linh Tran, CEO of XOI Beverage, knows that challenge well. Her strategy for overcoming the tough days? Celebrate the small wins and leverage community support while you do it. For Tran, she was able to utilize her experience at the Babson WIN Lab to "share those small victories with other entrepreneurs, which was one of the things that kept [her] going." Entrepreneurship can be all consuming. Especially when you don't have other obligations to help distract you. For Emily Bernard, CEO of PlacePass, burnout was becoming a real possibility until she received some sage advice from her father. "Starting and building a business is a marathon, Emily. It's not a sprint." Today, Bernard implements routines to help ensure that she is taking time to recharge, even on the days where she may not want to. She also notes that developing a balanced mindset around work-life balance is vital to success. So "while entrepreneurship is core to [her] identity, it isn't the only thing that [she is]." Shiva Kashalkar, CEO of Green Pinata Toys, understands the value that experts can bring to the table. Those who have "been there and done that" hold vast amounts of knowledge that can help early-stage startups succeed. And much of the time they're willing to share that knowledge. Her advice? Always ask for help and don't be shy about doing it. Kashalkar successfully engaged Rent-the-Runway's CEO, Jennifer Hyman, at the airport while en route to a conference. Happy to help out a fellow female founder, Hyman sat down with Kashalkar and gave her feedback on Green Pinata that few others have the expertise to give. Interested in learning more about women's entrepreneurship? Sign up for the Women Innovating Now (WIN) Lab newsletter series here to see what else female founders are accomplishing in Boston and beyond.